The moose test is what a Swedish company puts cars through to test how they react when faced with a sudden need to change direction at high speed. Japanese car maker Honda’s upcoming sedan for the Indian market – the Civic – was put through the Moose Test recently. With the car tested in ‘normal’ and ‘speed’ modes, we see what the outcome is. Moose test is basically a way to check the stability of the vehicle and how fastly the car can maneuver when faced with emergency direction changes. The driver swerves a moving car into left direction and then immediately to the opposite direction and checks if the car skids, flips or if the steering is fully under control. The moose test is designed to replicate an emergency direction change maneuver, similar to what would be required when an animal suddenly comes onto the road, directly in the path of a car traveling at high speed. Traffic cones have been set and Honda Civic has to serve into left direction and then immediately to the right at higher speeds. The entrance speed is 79 km/h with a stiff car suspension. Honda Civic spins a little here but the steering wheel accepts all the input by the driver making it maneuver safely and keeping the occupants inside the car safe. Following the first stage which turned out to be successful while the car was on stiff suspension, the second step was now to increase the speed to 81 km/h and check the results. Overall, here too the car remained in control but due to the spinning of wheels, the driver did hit some of the cones placed. The speed of the Civic has been increased again and now to 84 km/h. We can observe in the video that Honda Civic has no problems in terms of handling and reacts to steering commands sharply. 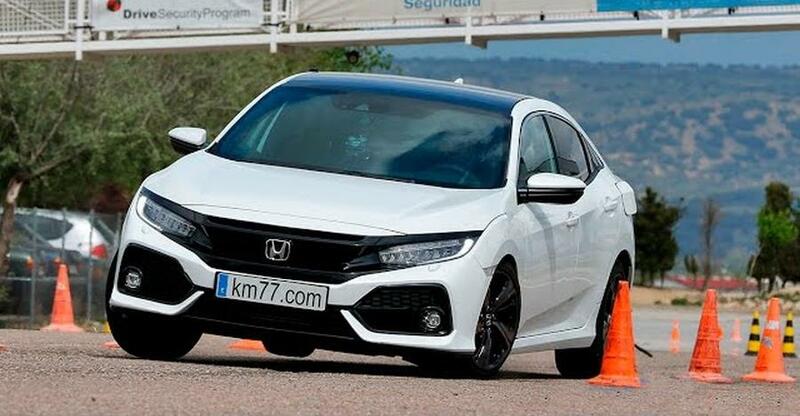 Honda Civic also does the slalom test. In this, we check how fast the car can change its directions while maintaining the grip. Electronic stability control (ESC) helps in maneuvering the car at high speeds thus making it stable and safe to drive on the roads. Honda will launch the Civic in India in 2019. The car’s design has been widely appreciated across the globe and will be a sportier model in the D-Segment category, and is expected to attract a lot of buyers. On the exterior, the Civic will get LED headlamps and tail lamp and there will be DRLs too. There will be chrome elements in the fog light housing and new alloy wheels too in the Indian market. Interior will see a large 7” touch screen infotainment unit with Apple CarPlay and Android Auto. The Honda Civic sold in India will be powered by both petrol and diesel engines. The 1.8-litre petrol motor will churn out 140 Bhp-174 Nm and will be mated to a six-speed manual and automatic gearbox options. The diesel engine will be a smaller one, like the one on the recently launched Honda CR-V, and will be a 1.6-litre motor churning out 120 Bhp-300 Nm. The new Civic will compete up against Toyota Corolla, Skoda Octavia and Hyundai Elantra. The pricing of the Honda Civic is not confirmed but we expect it to be priced similar to its rivals, at a starting price between Rs. 15-16 lakhs.